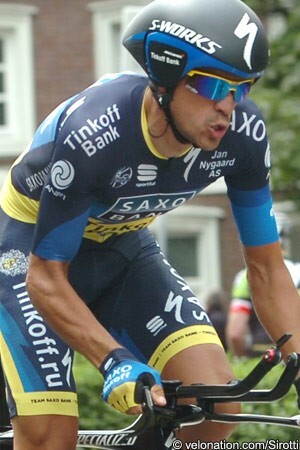 Although Alberto Contador is normally one of the quickest time trial riders in the peloton and is just over half a minute off the race lead heading into today’s Eneco Tour time trial, the Spaniard is playing down his chances of contending for a top spot today. The Saxo Bank Tinkoff Bank rider is in his first race back after a suspension and feels that he lacks the necessary sharpness when compared to the others in the peloton. Still, even if he doesn't overcome his 33 second deficit to the leader Tom Boonen (Omega Pharma Quick Step), he sees the race against the clock as being an important opportunity for him to test himself prior to the Vuelta a España. Contador’s been focussing on staying out of trouble thus far, avoiding crashes and finishing with the peloton each day. He dropped 26 seconds to Boonen’s squad in the stage two time trial, and also dropped a further five seconds due to a slight gap in the bunch at the end of Thursday’s fourth stage to Bergen op Zoom. Overall, he’s pleased. “I am very happy with these first five stages. There have been moments of great danger, the ends have been very nervous, everyone wants to be in front and the roads are narrow, but I'm happy because it is very good training,” he said. The race is by and large a flat one, but tomorrow’s final stage will give an opportunity to test riders’ climbing legs. While the climbs are nothing like the mountains that lie ahead in the Vuelta, a number of Classic ramps such as the Muur of Geraardsbergen will still give an insight into how his form is and, if he is feeling good, to move right up the overall standings.